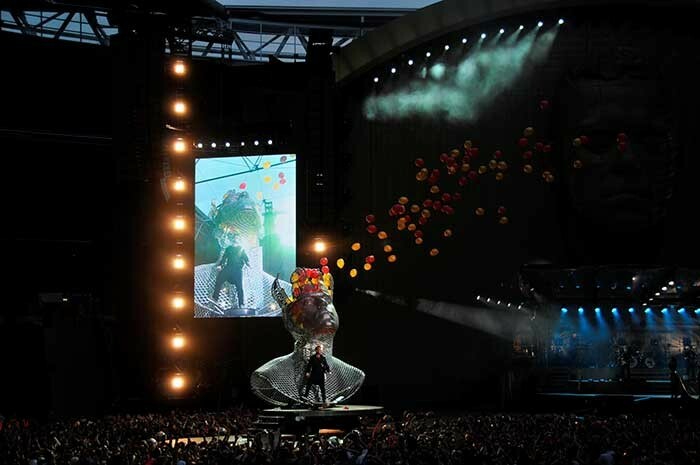 Set manufacturer Brilliant Stages has played the leading role in supplying the dazzling stage set for Robbie Williams’ Take the Crown stadium tour. 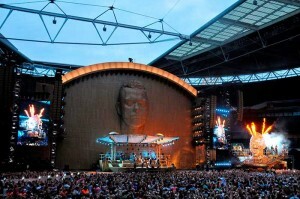 Brilliant Stages’ general manager, Tony Bowern was tasked by the tour’s production manager, Wob Roberts, to oversee the design, construction and delivery of elements including a series of replicas of Robbie Williams’ head, on-stage tracking solutions, a multi-tiered main stage with protective roofette and a curved header topping the massive back wall. In collaboration with a number of key partners, including fellow Prolyte Group subsidiary Prolyte UK, Brilliant delivered an exceptionally conceived and constructed product to the specifications of artistic designer Willie Williams and the late stage architect Mark Fisher. "Tony transformed our requirements into an enormous construction schedule which co-ordinated the contributions from all parties involved, as well as the elements from Prolyte UK and Brilliant themselves," said Roberts. "This took a lot of pressure off me as it meant I didn’t have to spend time chasing subcontractors – all that was handled by Tony and Brilliant Stages’ planning manager, Lucy Coe, who kept me well informed as things progressed. "The show demands a lot of set including some heavy pieces but, by using simple technology and a good build quality, Brilliant’s designs have made it very straight forward to construct." 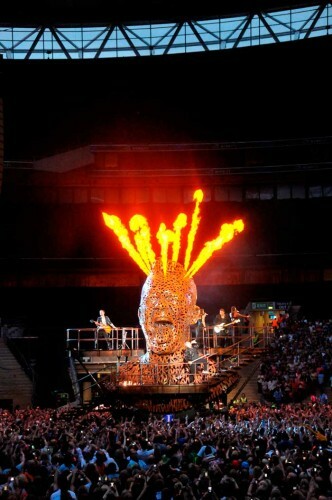 Brilliant co-ordinated the supply of three 7m high sculptures of Robbie Williams’ head - Steampunk, Phrenology and Skull - fabricated by MDM, 2D:3D and Perry Scenic respectively - from glass reinforced plastic (GRP). These were installed on Brilliant-built wagons and track downstage to B stage thrusts. Brilliant laid the tracks on top of Stageco’s main stage deck and incorporated infill sections that are removed to allow the heads to pass downstage and reinstated when not in use. Brilliant Stages added a curved staircase around the ‘rusted iron’ lattice-work of Steampunk to provide multi-level performing platforms for musicians, backing singers and Williams. 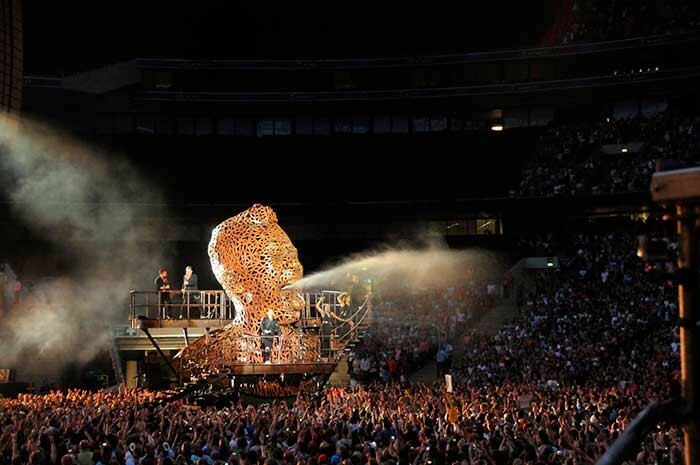 A revolving platform was designed into the B-stage thrust which rotates Steampunk to face the audience whilst a hydraulic slew ring in the neck allows the head to turn from side to side. The silver-coloured Phrenology head was built with six panels in the cranium which Brilliant designed to open hydraulically to release a cloud of helium balloons into the air as it tracks downstage. Carrying Williams and co-star Olly Murs, a further hydraulic mechanism in the neck allows the head to swing 25° either side of the vertical. The third head, Skull head, is a solid construction of translucent fibreglass which, when backlit, produces the appearance of a skull and tracks downstage carrying Williams in its mouth. Like the others, it is placed on a Brilliant wagon for transportation downstage. Brilliant Stages designed and built the tracking system to guide the wagons supporting the heads around the set into their cue positions. Brilliant’s John Prentice and Andy Edwards worked together with Warren Services to supply the chassis and hydraulics for each head. "We kept the mechanics simple, choosing to use hydraulic drive solutions over electronic elements wherever possible to guarantee the wagons performed seamlessly for all shows," says Bowern. "This lent maximum robustness and durability to the set, increasing its road-worthiness and weather resistance on tour." Sculptor Jacqui Pyle constructed four Mirror heads from polystyrene covered with individually-cut mirror tiles. Brilliant supplied air genie mechanisms to lift and rotate the four heads as they track onto stage in a Brilliant-designed protective box mounted on a wagon. Finally, the Crown head, which lifts 3m above the downstage edge of the stage, sits on top of a scissor lift, designed and installed by Brilliant Stages, who also added a 2m diameter performance platform in the crown. Overseen by Brilliant Stages CAD manager, Mel Welch, the design and construction of the three-level, gold-finished band stage also incorporated rope light embedded into the surface in patterns that replicate Williams’ tattoos. The system includes access stairs and ramps, and an innovative guttering solution to drain away rainwater. James Chapman, head of Prolyte UK’s projects division, and Prolyte lead designer, Dave Evans, worked together with Tony Bowern and tour project manager, Nick Evans to develop the roofette that surmounts the band stage. It incorporates a series of moving-head lights and is made up of three main components: steel main truss uprights topped by GRP domes, a lightweight aluminium truss bridge and a clear glass membrane canopy reminiscent of Mark Fisher’s Diamond Jubilee concert design. The gold powder-coated structure, designed to protect the musicians, diverts rainwater into a drainage channel and can handle wind loads of up to 25m/s. The system can be built at ground level then wheeled and hoisted into place, thus speeding up the build process. Prolyte UK also worked with Brilliant Stages to supply the large curved golden header which spans the full width of Tait’s back wall. Due to its exposed location, the design and engineering of this system was crucial. The header comprises a series of custom elements including curved lengths of Prolyte S52SV truss, suspension and angle brackets, pyro mounting points and light boxes for LED battens. The whole system is masked by a series of aluminium frames finished in gold to match the rest of the set. As is usual with Brilliant Stages’ projects, all elements were designed and built for quick deployment, breakdown and transportation. The whole takes just 6.5hrs to strike and packs into 36 trucks, ten of which contain the set. "Our major design considerations were that the set would work in conjunction with all the other suppliers and trades on the tour," says Bowern. "It had to be economical and efficient to transport, user-friendly and able to withstand the elements and logistics of a full-on tour. "It’s been a really satisfying project to work on and I’ve enjoyed every minute of it!" "The way Tony and Lucy managed all the different facets of the project was superb," concludes Roberts. "Communication was excellent and the schedule well managed which enabled us to plan ahead and for preparations to continue uninterrupted. I was very impressed."